The general idea of the “word of the year” isn’t particularly new: It seems to be popular in many languages and countries, according to the English Wikipedia, the German Wikipedia entry (other languages at the time of this writing are: Česky, Dansk, Esperanto, Français and Nederlands). However, I got the idea to pick a personal word of the year from my wife. This idea goes at least back to a blog post by Ali Edwards. The notion (as I understand it) is to pick one word to guide you thought that year. To me this is an interesting change to the more traditional new years resolutions, since it conveys the idea of having a guidance, or vision rather than setting (usually) unreachable high aims. It seems to me that a personal word of the year helps to move into a chosen direction. In a way it’s very much like a good vision for Scrum (and other!) software development teams — vision condensed into a single word. For all your small and bigger assignments you can quickly check, if what you’re attempting matches the idea of your chosen word, and then consciously decide if or how to proceed. Do you pick a word of the year for 2013? Which one? This post appeared fist at http://zenandtheartofautomatedtesting.eu/ on 18. Feb. 2012. Since I’ll take that site down, I relocate it. First of all: Why discuss ways to use Twitter as a tester? Well, almost all software is used in ways not anticipated by its creators. There are a lot of possibilities for a user to interact with the software — not caring about the system creators intentions. And this is something a tester should practice: Find new ways to use given things. 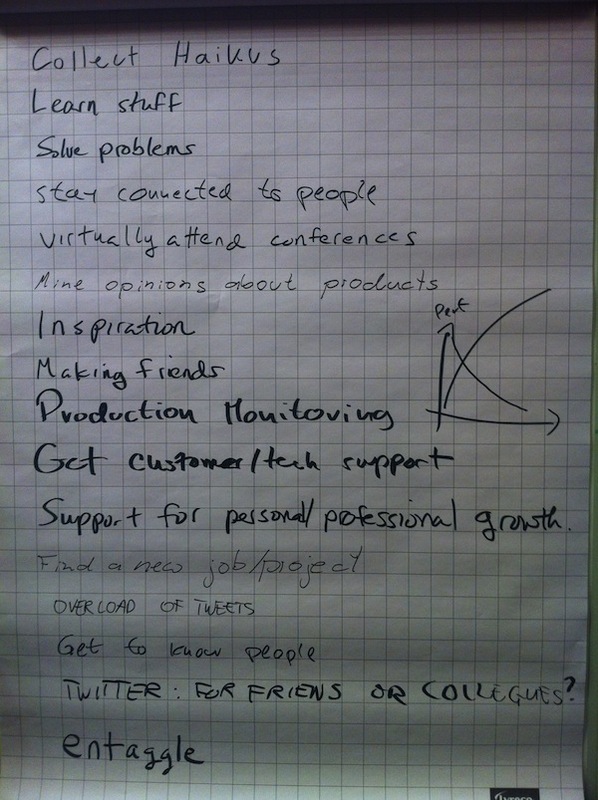 I learned about a few more uses of Twitter at the conference and thus suggested the topic “How do you use Twitter (or other social networks)” for the Open Space session at the Agile Testing Days 2011 in Potsdam. In the following sections I’ll comment on the items in the same order as we collected them on the flip chart. For a start I put up this one, still impressed by Liz Keogh’s Keynote about Hypnosis & Haikus. To generalise, I think Twitter can be used to share & collect about everything — given an account or hash tag to group it in some way. This one boils down to ask a question using relevant hash tags (e.g. #Ruby, #testing, #quality) and getting help quickly. At other times you get very interesting input you didn’t knew you needed before actually getting it. In my opinion staying connected to people I met/meet at conferences (or local gatherings) is extremely valuable. According to Neal Ford’s article Twitter Matters: Keeping Up with Weak Social Links, closely related people (family, friends or colleagues we see every day) often have the same information sources as we do, so their information isn’t new to us, while people we don’t know at all, tend not to share enough common interests, so their information isn’t as relevant to us. However, people we don’t meet too often (say once a year) have the most relevant and new (for us) information to share. This is an interesting one I hadn’t thought of before, but was immediately obvious when explained: Search tweets about a product and attributes people typically use when tweeting about it: #great, #FTW, #fantastic, but also #FAIL, #WTF, #isitjustme. Read what others think about a topic and follow shared links… This can yield entirely unexpected results/connections between topics. Sometimes the Good Thing ‘just’ happens. An example Lisa Crispin shared with us: She tweeted about being stuck at home without a plan for the weekend (since the original plan to go to a conference in London fell victim to the Ejafjällajökull eruption in 2010). She read a tweet by someone from England who could not fly home due to the volcano, tweeting from a bookstore in Denver, CO. Result: They met, did some sightseeing and became friends. Someone mentioned they’d monitor performance of their web application, by monitoring the tweet rate about certain words (I assume company-name, #slow, #down could be a start…) The more tweets (per time unit) they’d see, the slower the web application would perform. To me, that’s fascinating, even though it’s more a (very good) heuristic, rather than a definite measure: Your users might come from a single time zone, so a performance drop during the night isn’t noticed immediately, or there is a problem — but no increase in the number of tweets because of another significant issue, e.g. a network outage in the wider area. Some companies are very good at listening to tweets about their product, and answer with helpful tips and/or explanations. This seems to be similar to “Learn stuff” & “Solve problems”. This happened to me: After the end of a recent project I tweeted about my availability, got contacted, had a short interview and found a great new project. Excellent! Obviously this entry isn’t a use of twitter, but rather a (possible) problem: There are only so many tweets you can read per day. Tweeting about almost everything in your life might result in people unfollowing you. By following people, you get to know (a certain aspect of) them: How/What they think about a topic, how they react, whether they’re looking for someone to join for dinner at a conference. We also briefly discussed the use of different accounts for different purposes or groups of people: friends, colleagues, profession, (programming) languages… Depending on the number of tweets about a certain topic it can be worthwhile to create an account for it: This way you can filter out (or focus on) this particular topic. This last but not least entry is about the “other social networks” part of the sessions title. Entaggle was created by Elizabeth Hendrickson after a discussion about the value and sense (or lack thereof) of certificates for developers in general and testers in particular. On Entaggle you’d create a profile, be tagged and tag others using tags you (or others) create. That way a network of trust/respect is created. The reasoning behind this: People seem to trust the opinion of a real (and probably well-known) person more than an anonymous certification handed out by some institution or company. Opinions of real people matter, especially if you can get in touch with these people and ask for more information (or reasons for a tag they used). If you’re using Twitter in yet another way, I’d like to hear about it. This post appeared fist at http://zenandtheartofautomatedtesting.eu/ on 18. Oct. 2010. In At the Agile Testing Days: Alternatives to Certifications I explained my view on some of the possibilities that were discussed at in a session of the “Open Space” at the Agile Testing Days. (Also see Elisabeth Hendrickson’s summary of this session). This time I’ll list and comment the other mentioned ideas. One of the question we’re dealing with is still: What are ways to demonstrate your testing knowledge other than certificates? As in the previous post I’ll discuss suggestions made in this session. The idea is to demonstrate you care about your craft and demonstrate your work. However you’re likely limited in what you are allowed to report: As far as defect reports are concerned many companies will not allow to publish lists of defects you found. To work around this, how about Participation in open source projects as mentioned in the previous post? This information can be shared. Stack Overflow is “a collaboratively edited question and answer site for programmers – regardless of platform or language. It’s 100% free, no registration required.”1. Read the About on the site. Like participating in Open Source projects, Stack Overflow allows you to demonstrate problem solving (and finding) skills. A drawback I see, is the level of detail in the questions as well as the answers. Even though users rate each other, thus creating some level of reputation, it can be too hard to understand for non-technical people as hiring managers and project agents. Black Box Software Testing (BBST) is a four weeks (approx. 12 hours per week) course offered by the Association for Software Testing. Compared to the 4 days for the training and exam of the ISTQB foundation, the course offers a greater technical depth and more practical work. We vouch for is expired at the time of this writing, see this tweet by Brian Marick. It was meant to, well, vouch for others. In case you like to resurrect it, here’s “Brian Marick’s “:http://twitter.com/marick tweet about where to find the source code. These social networks which are targeted at business anyway can help finding a new contract or job. Both of them allow users to accept (or ignore) requests to connect to another user, creating (sub) networks of users who trust each other2. “Degrees” were also mentioned in this session. Since I don’t know whether this is about a specific (university) degree in testing or testing as a main sub topic in, say, computer science or software engineering, so I can’t elaborate about this. The “Miagi-Do School of Testing” was also mentioned and Markus Gärtner (@mgaertne on Twitter) referred to it in his presentation at the Agile Testing Days. Since there’s no “official web site” for Miagi-Do, finding the place is part of the challenge3. “Create Open Source Online Courses for ISTQB” ins’t actually suggesting an alternative to the ISTQB certification — however, it was mentioned in the brainstorming. Providing open source (or creative commons) material and courses requires some funding, though. “Testipedia” was another topic noted on the stickies, yet little is easily found on the web (apart from, well testipedia, but that probably wasn’t the subject). 2 …enough to link their profiles to each other. Whether or not this measures a level of trust reasonably or even indicates the experience or knowledge in a certain field is another question. 3 according to a black-belt Miagi-Do tester. This post appeared fist at http://zenandtheartofautomatedtesting.eu/ on 10. Oct. 2010. Since I’ll take down that site, the article is relocated. A session of the Open Space Day (facilitated by Brett L. Schuchert) at the Agile Testing Days dealt with alternatives to certifications. Elisabeth Hendrickson tweeted a link to the summary of this session already. Apart from answering the question “What is the value of certifications?” and “Do we need something other than certificated at all?” (neither of which I’ll discuss here), there’s one important question: What are ways to demonstrate your testing knowledge other than certificates? That’s what this article is about. I’ll elaborate on some of the alternatives we discussed. Some of them here were brought up by me, others were not. So, if you disagree on a topic you’ve brought up, please let me know1. I like the idea of learning from practitioners who have a better understanding and deeper experience in the field I like to learn about. This is a central idea of Software Craftmanship. The idea here is that at each stage you’d learn (mostly) from others one stage ahead of you. This enhances almost everyone in learning by teaching, certainly a very powerful way to learn and internalise material you’ve just learned yourself. Find someone who’s willing to help you to learn about the topic you chose and who’s experienced. Note, this is not as much about finding someone to actually teach you2, but help you teach yourself. There are lots of open source projects out there. Whether it’s automated regression checks (or tests, in case you don’t follow Michael Bolton’s terminology) exhaustive exploratory testing or other ways of testing (or checking): You’re probably using some open source software already, and improving this software by providing your testing feedback is a Good Thing. You help to develop software you’re using, making your own life better3 and you demonstrate your testing practice. By following other testers on Twitter (and may be the #testing hashtag, too) and joining the discussion is another way. Even by ‘just’ following others and reading the linked to blog articles alone I learned a lot. However, joining the discussion at your pace4 will give result in a significantly richer learning experience. 1 Of course I wouldn’t mind hearing about your agreement as well. And in case you do agree; I’d like to hear from you, too. 2 Experienced practitioners happen to be usually rather busy. However they’re also happy to help you to help yourself. 4 Some tweet at a remarkably high frequency, that’s not easy to follow at times. Don’t panic.